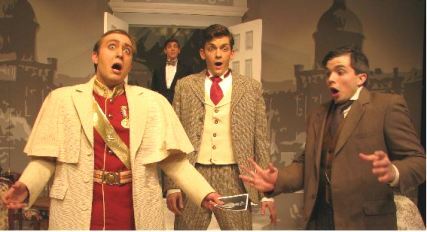 Not only do the major cast members contribute their own imprimatur on their portrayals, but director David Matheson has incorporated and permitted all the definitive characteristics of farce [exaggeration, improbability, extravagance & absurdity] in what kept this scribe in stitches from the opening scene to the final bows. The original may have been created in the early part of ‘the Belle époque’ but slip-on-a-banana slapstick STILL can evoke hysterics… however only if professionally done. Erindale has aced it! If imitation really is the sincerest form of flattery; then Feydeau certainly was a master. Aspects of ‘Stitch’ have been reincarnated in such contemporary works as ‘Hotel Peccadillo’ [doors]; ‘Sinners’ [infidelity]; Boeing, Boeing; [time scheduling] and of course – ‘The Apartment’ [assignation locale]. Putting all of these shenanigans into one stew makes cast demands prodigious and the UTM 3rd & 4th year undergrads are magnificent in both portrayals and execution. Even the occasional dialogue mix-ups were so well handled as to appear mandated. A married doctor decides to have an affair with one of his patients. Doc’s BBF has inherited a property that includes a bankrupt ladies wear shop… almost perfect spot for an assignation. BUT, the woman’s husband; the shop’s past customers; Doc’s mother-in-law; and their personal agendas all manage to screw-up the intended screwing session. The lanky and impossibly pliant Victor Pokinko possesses a mobile face that reflects; even augments his every emotion. We almost want him to actually manage a sexual home run. His wife is played by Alex Spyropoulos and her interaction with hubby; butler, and especially her mother, over-stereotyped by Megan O’Kelly cover the emotional gamut. She’s also a stunner! Pokinko’s target is Claire Sherwood and her husband is Mark Palinski. A more unsuited couple is hard to imagine – she’s arm candy; he’s a military ‘Snidely Whiplash’. Both manage to leave a strong impression on the audience. The ‘Best Friend’ character is named Bassinet; suitable as he (like your scribe) is vertically challenged. Being able to play a bore without boring one’s spectators is a thespian trial and Wes Payne handles it with aplomb. His continual attempts to articulate a certain story become as humorous at the late Bob Hope’s ‘corny joke’ reiterations. Out in the real world he may not get leading-man roles; but I foresee a successful career as a character actor or second banana. The hinge pin role that unites the convoluted sup-plots is that of the butler. Brian Postalian is a stand-out. Whether being overly lethargic; protective of his employer or overtly homosexual, the guy is a consistent hoot. There is a tongue-length comparison with Palinski that is so well directed as to be a visual pants-wetter. Speaking again of the director, Matheson’s oeuvre is detail , the most subtle gestures; blocking, or physical stance are fraught with meaning. The costumes are gorgeous; the ladies underthings funny rather than prurient, and both settings augment the mood & ambiance of the on-stage activity. The pace may be frenetic and some dialogue may be missed by the laughter, but this was a 2½ hours of continually being in stitches. Excellent review but what a pity you didn’t comment on the quality of the transaltion that made it( all possible. Sorry. What I should have said is that you don’t,in my view, put nearly enough emphasis the qualities of the translation.